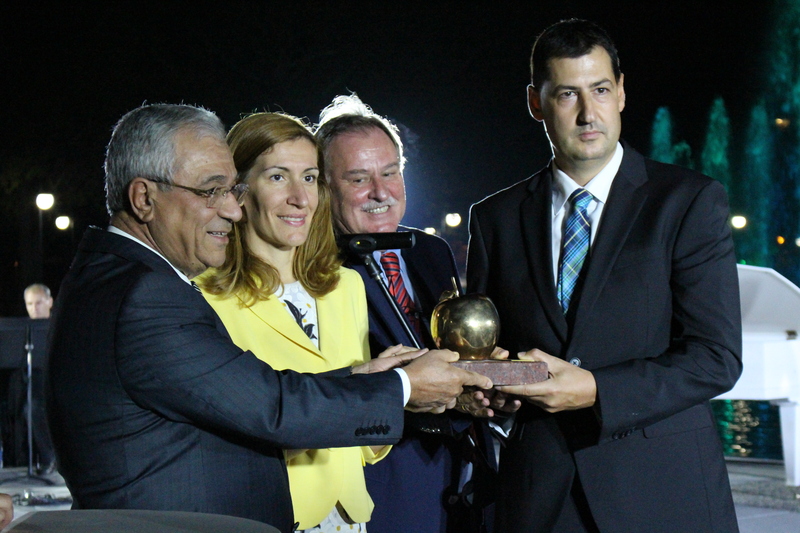 Plovdiv received today one of the highest esteemed awards in tourism – the Golden Apple. This took place during a ceremony attended by Minister of Tourism, Nikolina Angelkova, the Mayor of Plovdiv Municipality, Ivan Totev, the Chair of the Bulgarian Association of Journalists and Travel Writers (ABUJET) and BTA Director General, Maxim Minchev, the ABUJET Secretary, Plamen Starev, the FIJET President, Tijani Hadad, etc. „Over the years the city and the Municipality alike put in huge effort and fully deserve this award“, Minister Angelkova said. She reminded that several months ago one of the most esteemed events in winemaking – the global wine championship, Concours Mondial de Bruxelles – was held in this particular city. The Bulgarian city won the hosting competing with over 58 countries, including the biggest winemakers such as France, Spain, Australia, Chile, and Argentina. Minister Angelkova commented that just days ago one of the leading, global-impact British dailies – The Guardian – ranked Plovdiv in the top 10 must-see European cities. At the end of last month the esteemed publication Financial Times also published a large article about Plovdiv. „One must not overlook the fact that Plovdiv also won third place in the esteemed ranking Best 2016 European Destination, competing with leading tourism destinations such as Paris, Milan, Prague, Rome, Vienna, and Madrid“, Minister Angelkova added. She emphasized that now all efforts are focused on preparing the city to be the 2019 European Capital of Culture. The solid results are also confirmed by official stats. During H1 of 2016 some quarter of a million tourists spent at least one night in Plovdiv. This constitutes an over 13% year-on-year growth. "If we add all the day trips and stays at small family hotels, guest houses, and apartment complexes, Plovdiv will turn out to be one of the most visited tourism destinations in Bulgaria", Minister Angelkova added further. The World Federation of Travel Journalists and Writers, FIJET, nominated and awarded Plovdiv due to its excellent achievements. Journalists from France, UK, Romania, Spain, Italy, Croatia, Turkey, Egypt, Morocco, Lebanon, Tunis, and Bulgaria will be writing about Plovdiv and publishing their articles worldwide. The Golden Apple award has had more than 50 recipients since 1970. The Golden Apple award of the World Federation of Travel Journalists and Writers (FIJET) is for excellent achievements. It is awarded each year to an organization, country, city, or person as recognition for excellent efforts in promotion and enhancing the level of tourism.